Indiana Members Credit Union chief executive officer Ron Collier explained how this segment of auto financing providers can become “elitist” if all they do is book vehicle installment contracts with consumers whose FICO scores are 800 or higher. Perhaps credit unions aren’t originating contracts only with super-prime consumers, since the latest TransUnion data showed credit unions grew their auto membership by 9.8 percent year-over-year from the first quarter of this year compared to the first quarter of last year. In addition, TransUnion indicated that in 2010, only 49 credit unions issued more than 10,000 auto loans during the year. In 2015, analysts determined 126 credit unions were issuing more than 10,000 auto loans annually. TransUnion shared those data points earlier this week from Las Vegas when the credit bureau hosted its annual credit union seminar, which included participants from leading credit unions across the country. 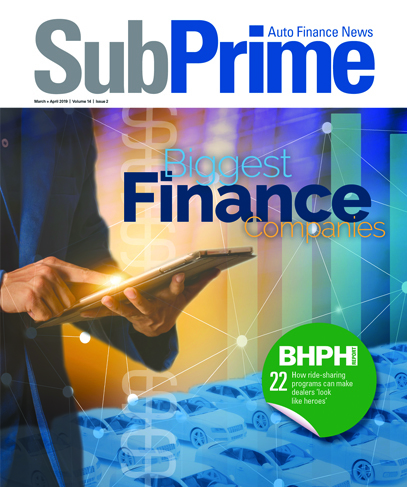 TransUnion arranged for SubPrime Auto Finance News to speak with a couple of them — Collier, as well as Mike Long, who is executive vice president and chief credit officer from the University of Wisconsin Credit Union. “The word subprime is kind of an unusual term for credit unions because we have members. I think we know our members a little bit better,” said Collier, who oversees an institution of more than 115,000 members who mainly are employed in the medical and education fields based in Indianapolis. “We still have kind of a traditional field of membership at our credit union. We know when negative things are happening in the medical or educational fields and allow for that,” Collier continued. “We try to strengthen a loan if a member has some bruised credit by getting a little bit more of a down payment or cosigner. That’s the method that we use. We look at the relationship they’ve had with us in the past. Indiana Members Credit Union does not participate in indirect auto financing, but Collier estimated auto constitutes about 20 percent of the entire credit portfolio the organization has — components that include mortgages and credit cards. Blossoming relationships with Indianapolis-area dealerships as well as a partnership with Enterprise Car Sales fuels the auto origination pipeline for Indiana Members Credit Union. For University of Wisconsin Credit Union, auto financing is an integral part of the organization, too. Long highlighted that the credit union does participate in indirect financing thanks to a relationship with CUDL, administrators of one of the largest lending service networks for credit unions in the United States. Through CUDL, University of Wisconsin Credit Union can reach more than 150 dealerships in the Badger State, and Long indicated that has helped the institution gain a top-two market position in Madison, the state capital and home to the large public university. He added that the credit union that boasts more than 214,000 members also generates originations in nearby Milwaukee, a much larger market. As a result, Long acknowledged that members who might have subprime credit end up in the application process. “I think credit unions are really uniquely positioned to serve their members with enhanced credit products, especially members who have gone through difficult times,” Long said. “That’s one of their priorities is trying to figure out how to serve as many members as they can with the products they desire. “If you look at how we buy credit, it’s not just a score. It’s not just a calculation. We’re trying to look at the overall relationship with the credit union, (to) analyze their ability to repay and their length of membership with us,” he continued. “Sometimes, bad things happen to good people. We try to find ways to serve those members at an affordable price with the products they want. We can’t always meet that need depending on their unique circumstance, but it’s certainly something we aspire to every day,” Long added about its indirect lending capabilities. Credit unions experienced a year-over-year member growth rate of 6.35 percent at the beginning of 2016, according to TransUnion’s analysis. Auto financing is part of the reason why. Long shared his assessment in light of the TransUnion data shared about how many credit unions now surpass the 10,000-contract threshold annually. “It’s interesting to observe the growing auto portfolios for credit unions, especially for those lenders who participate in indirect lending,” Long said. “The more open field of membership certainly has helped to facilitate the acquisition of new members through that channel. It’s not so much about trying to qualify for membership as long as you live in the community where the credit union is. Many times members are eligible from that standpoint. “Certainly from a supply standpoint, credit unions, at least our credit union specifically, has plenty of money to lend,” he continued. “Our members continue to bring us savings as they look for safety as they try to leverage their assets in different ways. We try to put that money to work in whatever loan we can. Auto lending has certainly been a focus of ours, as indicated in the survey. "Those third-party relationships enabling us to have the technology in order to facilitate those transactions makes it much easier for us and gives us a lot of creditability when we go talk to the dealership about why they would want to do business with us," Long went on to say. TransUnion found that in the first quarter of 2016, credit union membership grew at more than three times the rate of credit activity among consumers across other lender types such as regional banks or finance companies. According to TransUnion data, 25 percent of credit union members in Q1 of this year were millennials. In Q1 2013, millennials made up only 20 percent of credit union membership. Millennial growth for non-credit unions grew at a slower pace, up to 25 percent in Q1 2016 from 23 percent in the first quarter of 2013. Nidhi Verma, senior director of research and consulting for TransUnion, explained this movement is indicative of credit unions’ strategic focus on millennial growth. “Millennials are an important set of borrowers for credit union growth,” Verma said. “Credit unions are actively building their millennial membership, and in fact have experienced growth in this segment every quarter since 2010. “Millennials are likely candidates for new mortgages and other credit products as they age, offering credit unions a way to further their market share,” she continued. The research findings were coupled with a survey of 96 credit union executives, which gathered insights on key industry issues. The survey revealed that auto loans rank at the top for credit union executives in terms of loan growth, focus and opportunity during the next 12 months. The survey found that 42 percent of credit union executives reported an overall year-over-year member growth rate higher than 5 percent. In particular, credit union memberships via mortgage origination have increased in recent years. In Q1 2016, credit unions had 3.8 million mortgage members, an increase of 4 percent from 3.67 million in Q1 2015. Compared to five years ago, credit union mortgage memberships have grown 13 percent from 3.29 million in the first quarter of 2011.